© 2018 Funcom Oslo A/S ("Funcom"). All rights reserved. © 2018 Conan Properties International LLC ("CPI"). 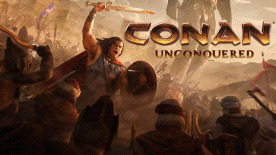 CONAN, CONAN THE BARBARIAN, HYBORIA, and/or ROBERT E. HOWARD and related logos, characters, names, and distinctive likenesses thereof are trademarks or registered trademarks of CPI and/or Robert E. Howard LLC. All Rights Reserved. Funcom and Funcom Logo ™ & © Funcom Oslo A/S.